Spybot Search & Destroy 2.7.64 Portable » TopFreeSoft.Net - Best Freeware Software! If all you require is to be able to scan and remove malware and rootkits from your system. Or if you want to protect your PC by immunizing your browser and hosts file, the ?Free Edition? is the choice for you. If you are a more experienced user you can also check various ?autostart? locations using the ?Startup Tools?. 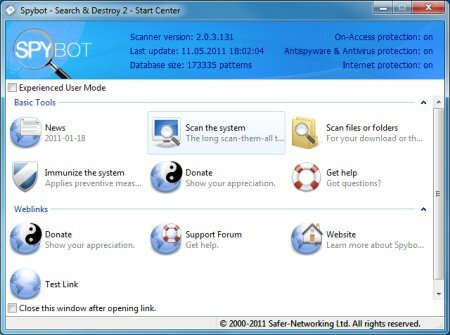 Spybot 2 can scan single files or specific folders and unlike other software it doesn?t matter if the file is located on your local drives or on a network share. Spybot 2 comes with its own whitelist which helps to identify if files are legitimate or not. This useful addition helps to speed up the scan.